If you follow any number of bloggers/influencers, you may have noticed that they regularly profess their love for different kinds of products. I am no exception. After a while, do you ever wonder if people still love the XYZ cleanser [insert any given product] they were praising a few short months ago? I know I do! I never share things I’m not passionate about, but I also don’t follow-up as often as I probably should. 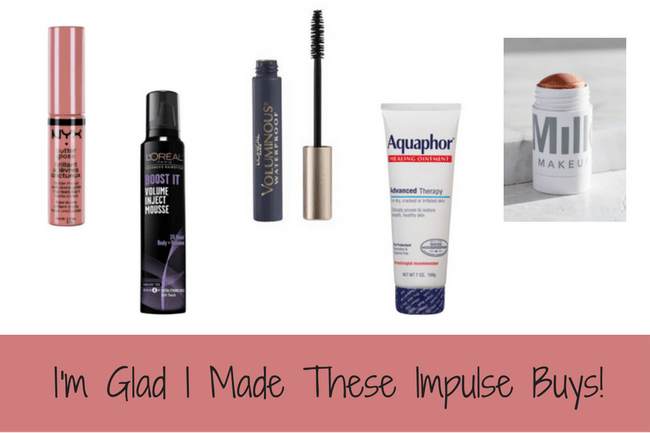 So today I’m talking about 7 products I’ve recently promoted either on the blog or on Instagram that I still love. These are thing I use daily/regularly and would recommend to anyone reading. Amazon Basics Packing Cubes – I’ve been raving about these packing cubes since my sister told me about them back in March. They are a freaking life saver when it comes to keeping your stuff organized, especially when you have to share a large suitcase with a toddler. Vishnu, Kaiden, and I all have our own set, and I’m tempted to order one more so we have extra bags for longer trips. C9 (Target) winter boots – These boots are saving me already this winter! They are SO warm, comfortable, and easy to walk in (I normally walk 1.2 miles to work and then back). I highly recommend these if you’re looking for winter boots that really serve their purpose…and are still pretty cute (IMO). Eva NYC Mane Magic 10-in-one primer – I’ve been using this spray for over a year or so now, and I LOVE it. I spray it on after washing and towel drying my hair and before styling. My hair is so soft and manageable after this stuff. Also, there’s a noticeable difference in drying time when I use this. I’ll be using this as long as Eva NYC keeps making it! Namskar Castor Oil – My eyebrows, as I’ve shared before, are no where close to as full as they used to be. To help with the regrowth, I’ve been applying this castor oil every night. Well, I didn’t for a while but am now super on top of it. Crossing my fingers that with regular use, I see some of my more bare spots start to refill. Drunk Elephant Lippe Balm – This lip balm, while expensive for what it technically is, has been saving my lips this winter. When I say I used to have the most severely chapped and flaky lips, I’m not even kidding. This balm keeps them so soft and smooth all day long. And for all my lipstick wearing friends out there, I think you will agree that there’s nothing worse than putting a lip product on chapped lips. This will solve all your problems! I even apply to my under-eye area before bed sometimes. I will be rebuying and gifting this for as long as DE makes it! And that’s all I’ve got today! If you have any questions about any of these products or anything else I mention here or on IG, feel free to send me an email (myinnershakti@gmail.com). Happy Monday, y’all! Maybe you’ve noticed that I’ve been blogging less lately? I’m trying to figure out how to balance MIS the blog and MIS Instagram page. I love writing long blog posts and really digging deep into a specific topic or idea. But recently, I’ve discovered that I also love microblogging on IG, and I really love the community I’m slowing building there as well! I haven’t figured anything out yet, but don’t worry, I’m not going anywhere on either platform. So much relief, I know! HA! In terms of life events and recent happenings, we’ve had quite a bit going on (well, more than usual) and more coming soon! 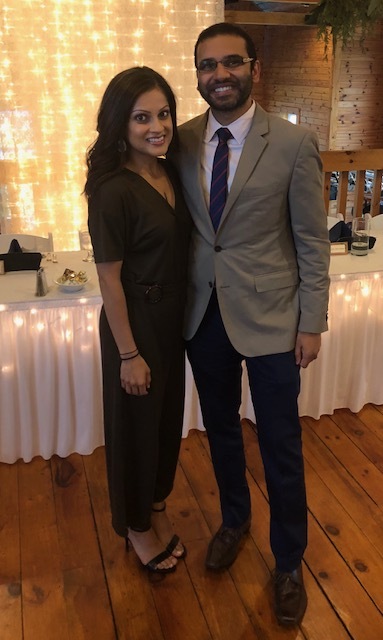 Vishnu and I spent this past weekend in Traverse City attending two good friends wedding. Since the wedding festivities were on a Friday, we made Saturday an explore and drink wine day. So much fun! And one of the best parts was that Kaiden had the opportunity to spend time with his grandparents. He had so much fun! This coming weekend, Vishnu’s cousin and his family will be in town, so we hope to spend some time with them in the city. We’re also going to see Hasan Minaj! A few of our friends who’ve already seen his most recent show said it’s amazing with really on point messaging. Woo hoo! 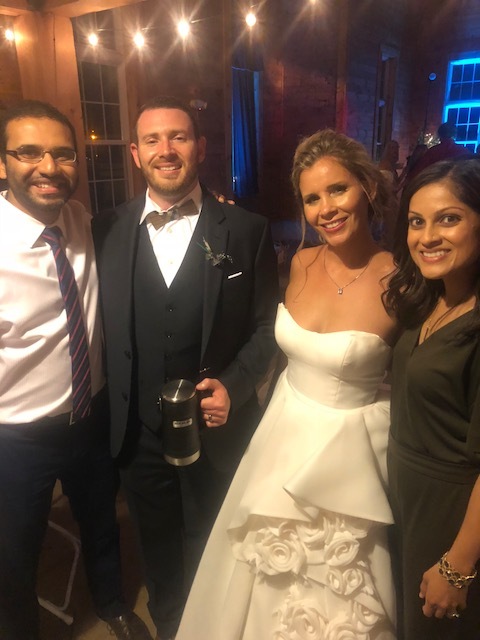 October includes a few big birthday celebrations – Vishnu, my sister, and Vishnu’s brother! It’s also the month Vishnu leaves us for 4 weeks! I don’t even want to think about it. I will say though that knowing my MIL will be here with us to help is a great relief! Also knowing we’ll be in Atlanta for a little over a week in early November is also giving me something to look forward to. Other than that, our little family of 3 is doing well! Kaiden is just getting bigger, smarter, funnier, and cuter with every passing day! He’s now imitating faces (it’s hilarious! ), running/walking REALLY fast, and starting to talk more. He’s still very much attached to me whenever possible, but it’s not as bad as it once was. And honestly, I miss his CONSTANT need for my attention! Vishnu’s busy with work and fellowship applications. I can’t believe in less than a year we’ll know where we’re headed next (or if we’re staying in Chicago). Crazy! And last but not least, I’m doing well too! I feel so much more motivated and excited about stuff than I did just a few weeks ago. I’ve also been keeping up with my workouts (BBG, treadmill, spin) which makes me feel good and on top of my s***. Overall, all good stuff. Mega Blocks – I got these for Kaiden a while ago, and at first, he was all about throwing the pieces around. But as of late, he’s really been into building AND knocking them down. It’s fun to watch him figure out how to connect the blocks, identify colors (sometimes! ), and get excited about whatever we’re building. These are a true pain to clean up but worth the joy they bring! Pacifier clips – My friend Pankti told me about this genius product, and I wish I would’ve known about it sooner. Kaiden is notorious for throwing his pacifier and then crying about it. Now, even if he tries, it ain’t going anywhere! These are truly a lifesaver, especially when we’re out and about. Summer Infant 3D Lite Stroller – Vishnu and I needed to invest in a travel stroller and fast. Kaiden’s now in a convertible car seat so we can’t really use the car seat + frame stroller method when we’re out and about. We used Summer Infant stroller for the fist time at the museum, and Kaiden didn’t seem to mind it all. It’s easy to use and is pretty generous in terms of space for things other than your baby. Amazon Basics Packing Cubes – My sister introduced me to the concept of packing cubes, and I haven’t looked back since. These little guys really do keep everything organized, which is always my biggest problem when travelling. This is a must own product if you ask me. In fact, I literally just bought Vishnu a set in black. Amazon Basics silicone baking mats – I wanted to get silicone baking mats so that I can steam roast veggies for K, since regular roasting isn’t his favorite (yet!). The name brand one was just too expensive for my liking, so I decided to give the ABs one a try and so far so good! If you want to know more about steam roasting, visit the @calebthefoodie IG page for me. It’s a great resource. Beartown+ Us Against You – This little book duo is freaking amazing! I can’t recommend it enough. If you’re looking for books that grip you from the beginning and take you on a journey with some incredible characters, these two are for you. Oh yes, I’m changing the title of my Friday [Favorites] posts to ‘Friday Things + Favorite Links.’ Exciting times, I tell you! Overall, this week turned out to be a good one. Kaiden and I got to see some of my favorite former and current coworkers, celebrate Thea’s birthday, and eat some delicious food (Frontera Grill and India House). YAY and YUM! I’m trying to get back into my weekly meal planning mode because it helps keep us and our bank account in check. Also, we can’t/shouldn’t eat cereal for dinner every night. Pre-Kaiden, the food I made ranged from super simple to a little more involved. Now? Meal prep needs to be minimal and super duper quick. 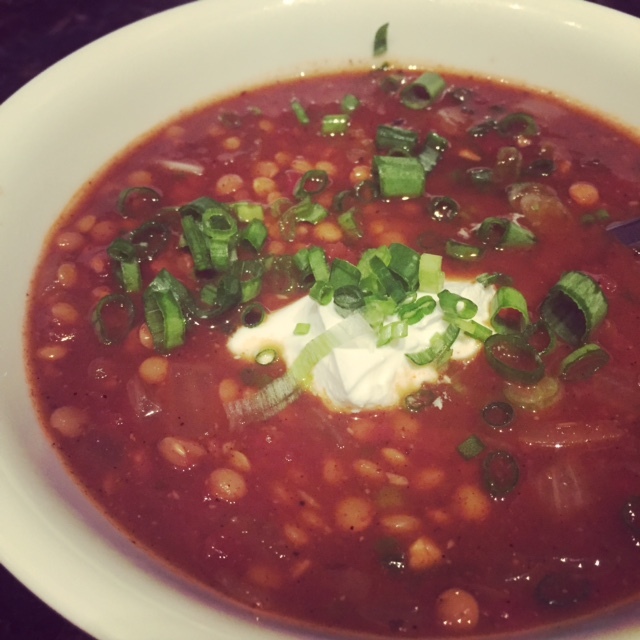 I made my vegetarian lentil chili the other night, and it totally fit the bill. Next time I may double the recipe and freeze a portion for later. I also made (threw together?) quick Southwestern salads one night. 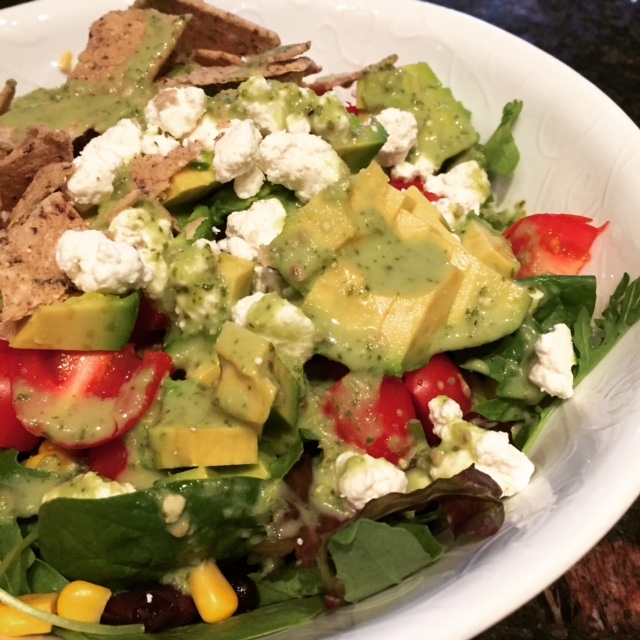 Salads are the best bet right now…as long as I know exactly how I want to craft them and have everything pretty much ready to go. 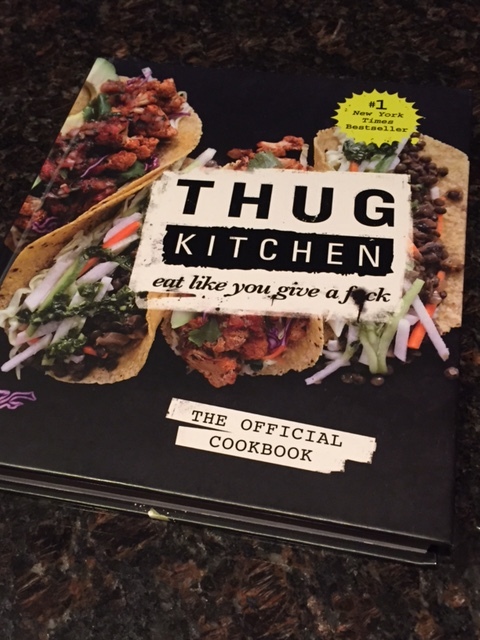 At some point this weekend, I plan to make Pad Thai from the Thug Kitchen cookbook my sister let me borrow. This is neither quick or easy. Yeah…soooo…wish me luck! Also, a review of this hilarious cookbook is coming soon! What else? Vishnu worked a short call shift on Thursday (8a-8p), and that was the day Kaiden chose to freak out if wasn’t holding him at all times. I somehow managed to fit in a Barre3 Online workout…with three breaks throughout of course. And that’s about it. This little guy of ours, I tell you! And now for the highly anticipated links of the week! Shame is something we all experience but not something we all know how to deal with. I know we still have some time, but I can’t wait to introduce K to real food! With that, I wish you a happy Friday! You guys, it’s FriYAY! I’ve been waiting for today since…well, Monday! My mantra this week has been “just get to Friday.” And now it’s here. YAY! It hasn’t been a bad week or anything like that. Just jam packed. So much going on! I’m ready to relax a little. 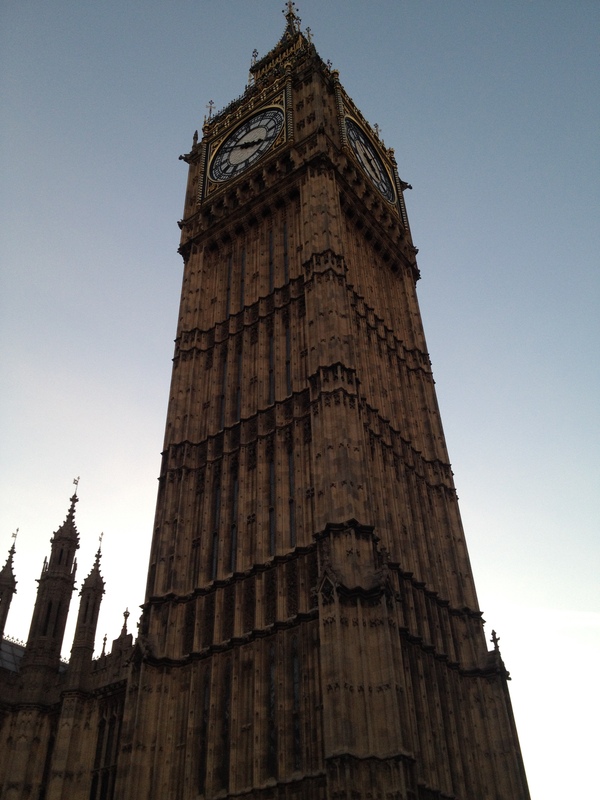 I’m headed to London next week for a work! I’ll be there for just over 48 hours (a super short trip) and can’t wait to see my coworkers and eat Pret’s porridge. It’s going down! 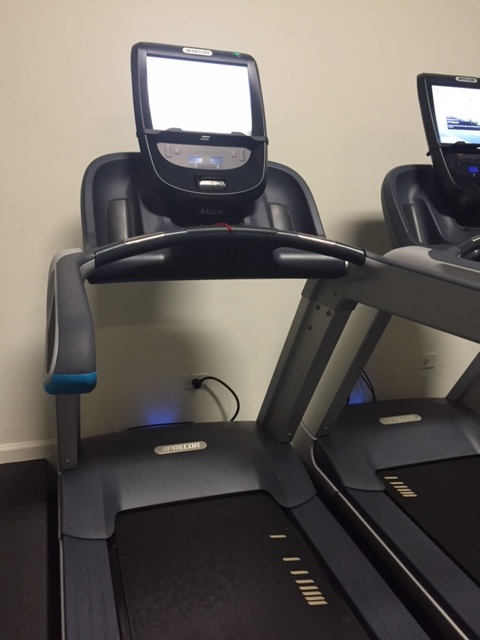 I walked into our gym on Tuesday (after a few days away), went through a strength circuit, and then headed to the treadmill for an interval run. It took me a few minutes, but I quickly realized that we have new cardio equipment. Best day ever! It’s so pretty and clean. So I’ll be honest. I’m only a little over half way through When Breath Becomes Air, but I already believe it’s one of those books that everyone needs to read. It’s deeply beautiful and inspiring, and I won’t lie, very sad at times. The other night, I cried myself to sleep…in a good way. I know how silly that sounds, and I won’t even try to explain it. All I can say is, you have to read the book. It’s one you won’t soon forget. Also, I was shocked when I saw that this book has over 4,000 reviews on Amazon and a 4.5 star rating! If you’ve been searching for the world’s best pens, stop right now. I have exactly what you’re looking for! 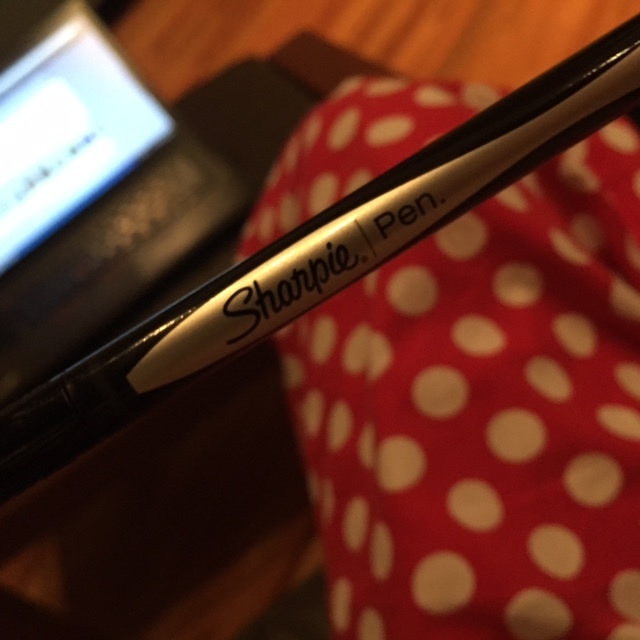 The Sharpie pen is life changing. The ink doesn’t bleed through paper, the fine point tip is so precise, and it’s smear-proof. Not to mention, it makes your handwriting look that much better (yes, even mine!). I’ve pretty much convinced half our office that the Sharpie pen is the only way to write. Now if only Sharpie was looking for a passionate spokesperson! I joined my friend (and coworker) Thea’s fantasy football league last year and had so much fun that I decided to do it all over again this year! With last year being my first participating in an established league, I didn’t know what I was doing. I didn’t finish in last place, but I definitely stumbled my way through the season. This year I’m going in with a plan…or at the very least a list! My favorite part about this year’s draft is that it falls on Thea’s birthday! Can’t wait to celebrate with her. 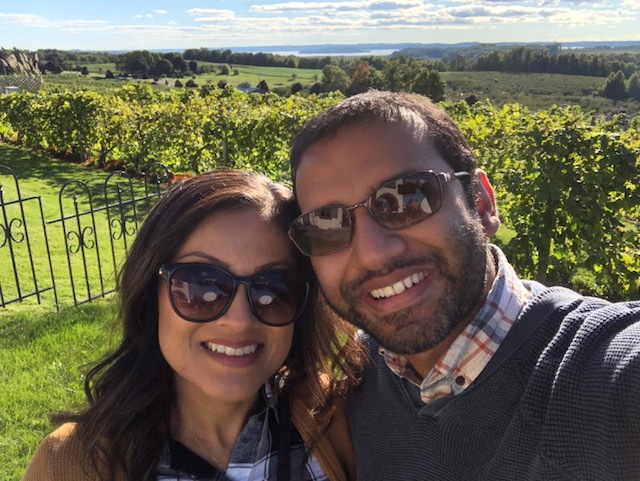 For Labor Day this year, Vishnu and I are hosting our families as we all spend the long weekend together celebrating both of our dads’ birthdays (milestone ones at that!). I can’t wait to see everyone! I have a pretty detailed agenda and plan to ensure we make the most of our time together. I’ll share more soon! Annnnnnd…that’s all she wrote! I hope you have a wonderful weekend! Your turn – what’s something you’re passionately loving right now? I started my [slightly modified] Par’s Picks series to share all of the products, blog posts, and articles I love. And while it’s fun to share monthly favorites because they’re so fresh and new, I think it’s even more useful and helpful to share the things I continue to love over time. With that being said, I reviewed my Par’s Picks archive and looked for the products I still use every single day. It was hard, but I was able to narrow it down to four of my favorite products. Enjoy! 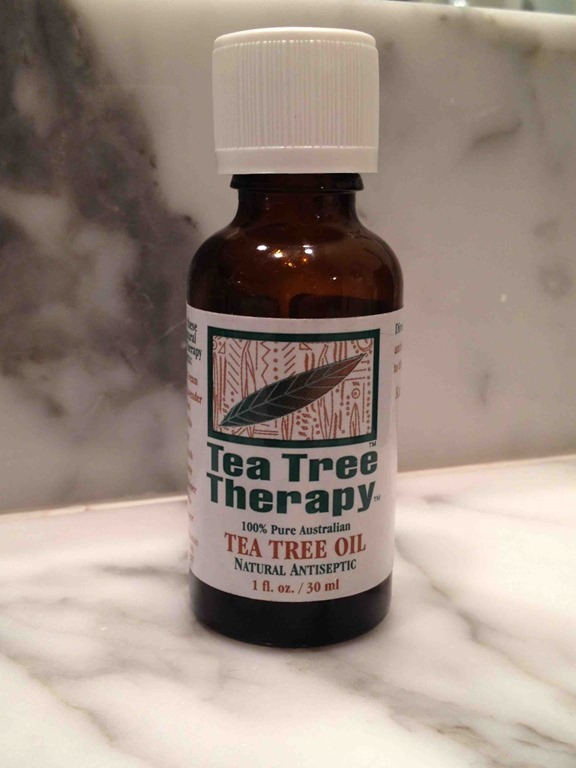 Tea Tree Oil – I’ve blogged about this stuff over and over again, and I’m not stopping any time soon because it’s the BEST. I can’t claim that my skin is acne-free, however, I can say that my blemishes are under control (for the most part!). Progress over perfection! 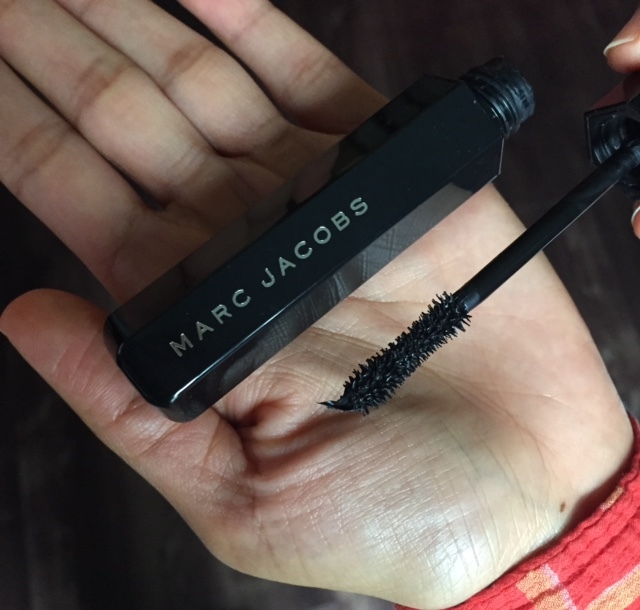 Marc Jacobs Velvet Noir Mascara – You guys! I’m seriously in love with this mascara. I’ve tried a lot of mascaras, and this is by far my favorite. I’ll admit that my lashes are pretty full and long to start with, but this stuff gives them extra an oomph and helps them stand out even more. LOVE LOVE LOVE! Jaybird X2 Sport Wireless Bluetooth Headphones (on sale!!) 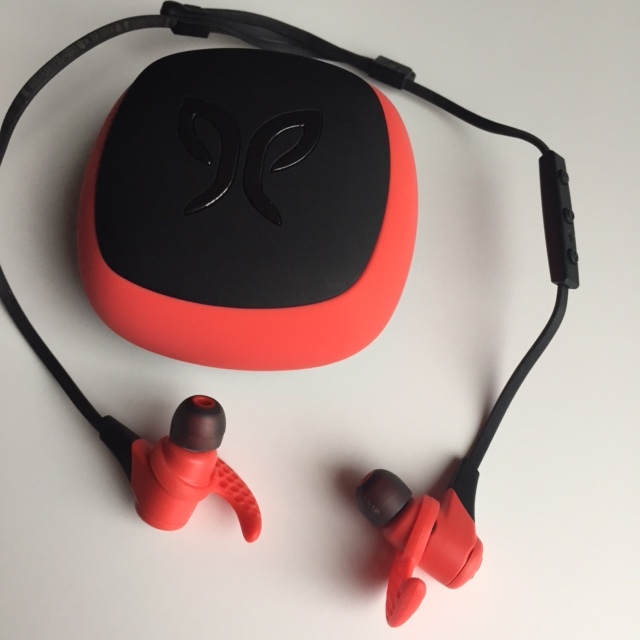 – These wireless headphones are easy to use and super comfortable. Since receiving them as a gift from Vishnu, I’ve used them during every single workout. Life changing little gadget! 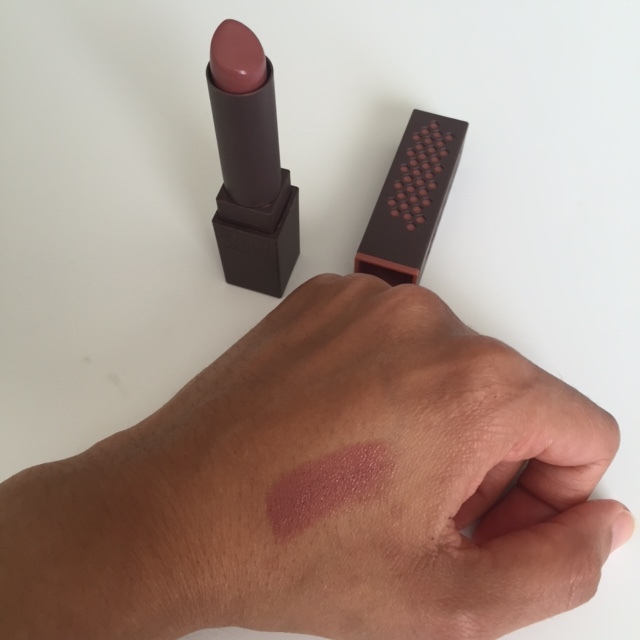 Burt’s Bees Lipstick in Suede Splash – If you haven’t tried Burt’s Bees Lipsticks, you’re missing out! The formula is so creamy and light, and the colors are beautiful and rich. I mean, what more can you ask for! I love Suede Splash so much that I bought Scarlet Soaked, the most perfect shade of red (and I’ve been looking for a while). LOVE! Your turn – what’s a product you highly recommend and use every single day? I feel like beauty blogging/YouTubing has taken off in the past few years. And I love it! My bank account? Not so much. While I don’t follow a ton of YouTubers, there are four in particular that I try to keep up with on a regular basis. Not only do these women share wonderful reviews and tutorials on their channels, but they bring their entire personality with them. They interact with their followers as if they are friends. Not that novel in this new digital world but very much appreciated! If you love beauty products as much as I do or if you want to learn how to apply makeup or if you want to know whether you should splurge on that lipstick, these four beauty gurus have you covered. With that, here are four must follow beauty YouTubers! Sazan Hendrix – Not only is she gorgeous, but Sazan’s videos are fun to watch, and her tutorials are easy to follow. Personally, I follow along for the beauty tips and tricks as well as the relationship videos she creates with her husband Stevie. Sometimes I make/force/whatever Vishnu to watch with me! Sona Gasparian – Sona is a former makeup artist. Her videos are so put together, and her product reviews and tutorials are well thought out and super informative. Teni Panosian – Teni is probably the most edgy (ish) beauty blogger I follow. Like the others, her stuff is great, but what I love most about Teni is her honesty. You can tell when she absolutely loves a product, and when she doesn’t, she says so. Deepica Mutyala – Deepica’s story is inspiring, and it’s been fun to watch her channel and brand grow. Her very first video about how to cover dark circles with red lipstick is just over a year old and has over 9 million views! Deepica is a favorite because she’s obviously South Asian like me, and many of her reviews are catered to that population. So appreciated because it really can be hard to find products that work on darker skin tones. If you haven’t jumped on the beauty YouTube bandwagon, I highly suggest you start with these four channels and go from there. You won’t be disappointed! Your turn – what are some of your favorite YouTube beauty channels?